Nemoid Studio’s Dino Rush is a running game for iPhone/iPad featuring a little dinosaur named Dundy whose voracious appetite drives him to eat whatever he can get his teeth on as he runs through a prehistoric tropical jungle. In his path are predatory dinosaurs, quicksand, lava pits and other obstacles that Dundy must jump or fly over in order to avoid being injured or killed. With five different worlds to explore and three other characters to unlock, Dino Rush has plenty of replay value. Controlling Dundy is rather simple. 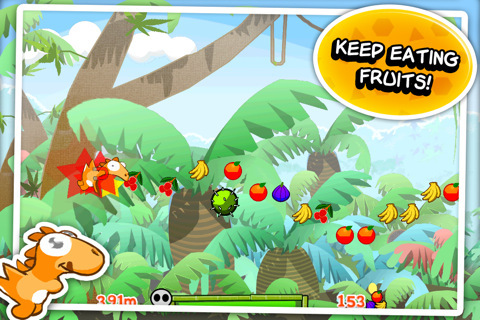 While he is running, tap on the screen to jump in order to avoid obstacles and reach fruit hanging in the sky or on top of platforms. Special items such as a little ‘S’ or a star may be picked up along the way, allowing you to either fly or bulldoze everything in sight. Picking up the magnet draws all the surrounding fruit towards you so you don’t have to jump for them. Eating a chili pepper will result in Dundy running with his mouth on fire. Of course all these special boosts are temporary so be careful of getting too excited. Running into a pterodactyl when you’re not invulnerable can be rather painful. There is also a Bonus Shop that allows players to use their points to buy more of these special items to be used in the game when they need something (but hadn’t been able to pick one up on the way). Once you’re finished with Dundy, other characters will be unlocked, allowing the game to continue. One terribly unique thing about Dino Rush is that instead of starting you off with three lives, Dundy starts with a health bar. Eating fruit allows you to gain health and recover from damage–therefore staying in the game longer–but if you neglect to continue to feed Dundy, he will die from starvation. And like starvation, the death is slow and painful. Unlike other games where characters flicker and then disappear off the screen, Dundy’s death is gradual and rather sad: the little dinosaur eventually flops down on the ground with X’s for eyes and his tongue hanging out. The music is a fun drum beat rhythm that goes along with the jungle theme. The sound effects are pretty good (chomping sounds, screams, and panting when Dundy is tired), signaling that you’d better start eating fruit or prepare yourself to watch Dundy die. The graphics are bright, colorful, and sharp, making things interesting on the screen. Game play is rather simple, although there are some lingering issues with lag that the creators have tried to fix with updates. Although the graphics and sounds are great, Dino Rush is more like a clumsy version of Yoshi from Super Mario Bros. Dundy is continuously running at high speed, causing you miss a lot of the fruit. The creators might have intended this to be part of the challenge of keeping Dundy fed and alive but it’s rather unsatisfying for those gamers who enjoy consuming everything in sight while running towards their goal. It also makes keeping Dundy alive through constant nourishment a real pain. Trying to anticipate enemies is also tricky due to the speed Dundy runs at. The lack of a real story line other than keeping Dundy fed and alive makes it a bit boring. The potential for a really fun game is there in Dino Rush but it might take more updates or a sequel to really get there. 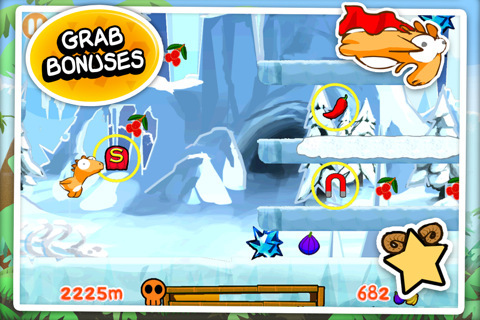 AppSafari review of Dino Rush was written by Julie Guan on March 1st, 2011 and categorized under App Store, Fun, Games, iPad apps, Universal. Page viewed 5398 times, 1 so far today. Need help on using these apps? Please read the Help Page.